A hand injury sustained last September ruled the 22-year-old out for a longer layoff than initially anticipated before his overdue return to action last month. 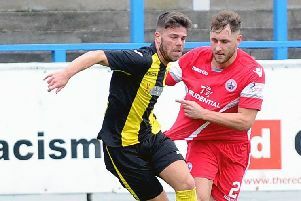 Now the former Cowdenbeath player is hoping to make up for lost time in the company of his older brother and January signing, Scott. Despite missing a large chunk of the campaign and failing to recover sufficiently in time to aid relegated Whitehill’s battle against the drop, Wright admits a catalogue of errors have cost the Rosewell club dearly. Ahead of tomorrow’s clash with Edusport Academy at Ferguson Park, the winger said: “I dislocated my wrist against Spartans then spent the next five months in a cast, which I never expected to happen. “It was quite upsetting to be side-lined for such a long period of time because I had a good season last year and was looking to build on that, but it’s been very frustrating. “We just haven’t been good enough this season and a series of blunders have cost us. We’ve had a lot of players come and go and been through three different managers, so at no point have we had a settled squad. “That certainly didn’t help our cause and a combination of injuries and suspensions made it even harder. “I joined the club last season under Smally (Gary Small) but was suspended for the first two games of this season, so I didn’t get the chance to play under him. Then Jock Landells came in and added a few bodies and Yano (Ian Little) did likewise. “Our performances lately have been decent, but we’ve just not had the rub off the green and managed to get the results we needed. That’s what happens when you’re down at the bottom of the table. Regarding his future, Wright is unsure on whether he will remain a Whitehill player next term but admitted he has held positive talks with manager Ian Little. “It’s still early days but we’ve already had a few conversations about next season,” he stated. “I’ll wait until the season is finished before making a decision. “I was full-time at Cowdenbeath for three years, so I’d like to get back playing at a higher level one day, but I need to focus on getting myself back to full fitness and playing consistently just now. “My brother has made a big impact since he signed for the club and it’s been a great experience playing with him. That’s been a massive positive for me from a largely disappointing season. Elsewhere this weekend, Spartans will look to bounce back from their 4-2 defeat against Stirling University on Tuesday night with a victory over East Stirlingshire at the Falkirk Stadium. That result dented the Capital club’s aim of breaking into a top-four place but boss Dougie Samuel will be hoping for a positive response from his players. Civil Service Strollers will bid to halt back-to-back defeats when they travel west to face a wounded Cumbernauld Colts outfit at Broadwood, still reeling from their 5-0 defeat at the hands of depleted strugglers Vale of Leithen. Meanwhile, Edinburgh University make the journey to Innerleithen, desperate to back up their recent victory over Gretna 2008.